Stay tuned for upcoming events for Sahara UK Live in Wah Cantt in near future. 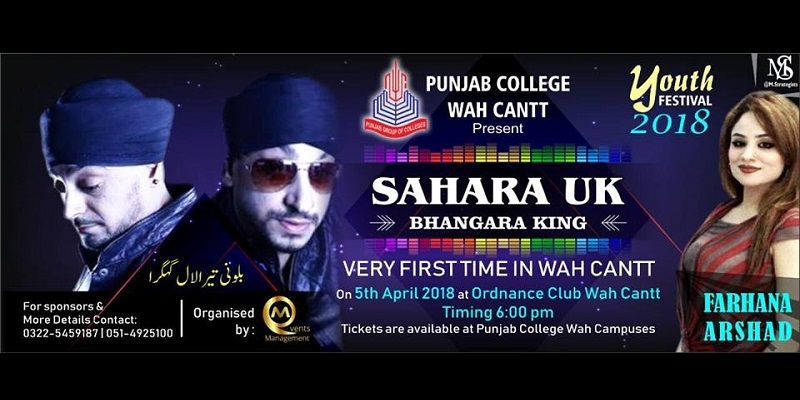 Sahara UK will perform live on 5th April 2018 at Ordinance Club, Wah Cantt. This musical concert is part of Youth Festival 2018. It is being organized by Punjab Group of Colleges (Wah Cantt). This gig is being managed by M_Events. Music artist Farhana Arshad and underground singer Fahad Hussain will also participate. Music fans get ready for this extravaganza musical night. Best Viewed at 1024 x 768 pixels and above. This Page loaded in 0.08968 seconds on Tue, Apr 23, 2019 (21:40).